You are currently browsing the archive for the Actual Play category. Redid the boss battle, and managed to keep Corona alive. Unfortunately, much like the grinding near Orvis, I’m hitting another brick wall in regard to levelling. You see, the next area is a new continent once you use your pass to unlock the tunnels. The hero's present stats. Notice that we have 1492 credits. The grinding will take a while. The monsters, as per usual, are worse on the new continent, and there’s a money grind as well. Basically, if you bought the best of the new weapons, you’re looking at 28,000 gold. One curious thing about how levelling works in the game. There’s actually a sort of anti-cheat function. Experience levels seem to be dependent on your stats. So, for example, if you give yourself extra points to build the character, you’ll level more slowly. You will also get less EXP if you’re wearing better armor. It may actually be better to fight with bad equipment till you hit the level you want and then upgrade. Other than that, I fear, I’m merely pushing my way through grinding in the game. 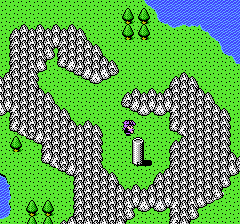 Vedia Tower is basically designed to foil a map maker. There’s confusing strings of one room areas. There’s multiple paths which circle back on themselves. Assuming you’ve got maps to the area, it’s not too bad to explore. The first four levels are basic mazes with some new annoying additions. These Amb are pretty easy to fight. I’m to another point in the game where I have to grind. Every trip to Mong (where I got the Litromin medicine) gives about 600 credits and there’s a couple spells and items that are nice to pick up. This tower is the area I need to get to next. The first fight inside killed me after hitting the hero for about 30 HP. So, I attacked more of STED. I’m mildly under levelled, though I’m about to upgrade to the Blue levels. These are a fairly significant boost. The money rewards from battle have also improved. Now, each battle near Mong gives about 100 gold, and a walk to Mong gives about a thousand. Unfortunately, enemy groups range from two to six enemies, and a bad randomizer roll could have your characters dying easily. People in Mong are worried about Shiseikan. Continuing with my theory of “increasing complexity,” STED is still adding new elements. Now, there’s enemies that are strong to weapons and weak to magic. In the path to Mong Town, there’s a splitting enemy that is weak to magic. An enemy destroys your ESP skills (the first one in your list) and there’s another one near Mong that destroys the first item in your inventory. These skills are rare, but can be very annoying if ill-timed. Poison appeared near the second town, and sleep pops up near Mong. A final new element is that you start to get limb damage in the path to Mong, due to the enemies using targeted hits. Here, there's enough leg damage to get the paperdoll to show the damage. So far, I’m facing the sharp difficulty curve in the early part of STED. Basically, when you hit the “Red” bank of levels, your stats almost double, so you need to push ahead to that point so you’ve got the stats to handle upcoming trials. 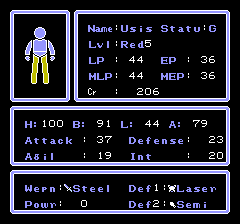 Usis' stats at the beginning of the game. Updating my progress in STED. So far, I’m just getting into the “Red” set of levels. These provide a major stat boost. 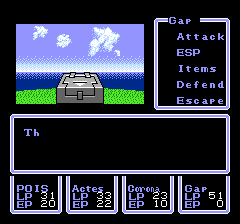 Unfortunately, this also seems to bring in a slightly stronger group of enemies near the far town. I need to earn about 600 to buy the next weapon upgrade for the hero. Each grinding run to Hyu has about 200 gold net profit, unless if it goes badly. The poison status effect is in action on the hero. This is in the middle of opening a treasure chest found after battle. Interestingly enough, poison doesn’t seem to act like a standard status effect. I believe it blocks you from healing, but it doesn’t cause flashing on the map, or persistent damage. Another annoyance was that before doing a grinding run to Hyu, I had 40 HP on Actes, and almost 30MP on Corona. Since it’s very easy to die, it’s actually simpler to die and clone your characters rather than to heal the body damage. As I recall, the next area of the game is the first that starts to make you need to heal your character’s body damage. When I say that the controls are awkward in STED, it’s kind of hard to explain what I mean. After all, there’s a certain level of awkwardness in any NES game, due to the size limitations and conventions of the era. A good example of this would be how you talk to people. 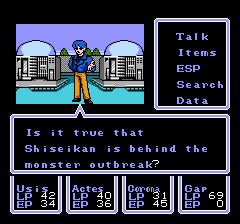 In STED, like many early RPGs, you must have the person facing you, and then you bring up the menu and select talk. No modern game would force this to be the only way to talk. How various games handle this more archaic system is relevant, however. For example, in STED, you can ‘bump’ a person to make them face you. This is nice compared to some systems that make you hunt down a villager and try to force them to face you. On the other hand, if you try to talk to a person not facing you, you get nowhere fast in STED. Someone in Orvis talks about the ancient robot "Reedpark." 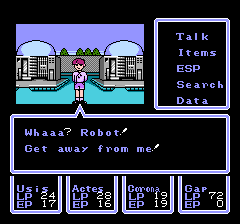 This scared kid may imply the robots are scarce or scary in this world. STED came out in 1990 and was published by KAC. The developer was ADK (Alpha Denshi) who seems to have not really done that much other RPGs. It feels like a Phantasy Star clone in that it has a number of elements that are similar to the series. 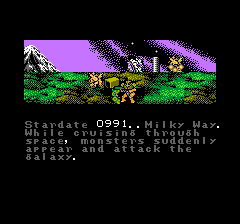 For example, the talking cutscenes look a lot like Phantasy Star. 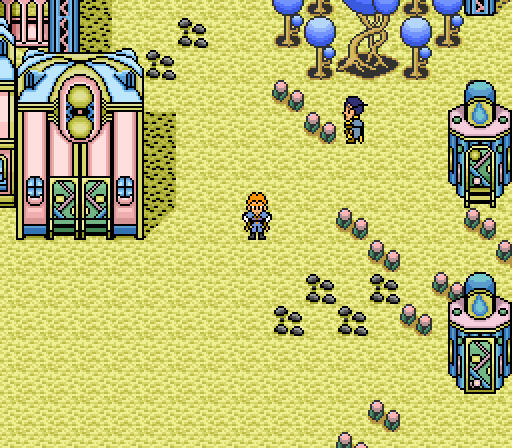 The implications of a conspiracy also resembles Phantasy Star’s dsytopia. The opening cutscene in STED. Your characters are answering a distress call from a planet. I’m going to talk about the beginning of the game, since it progresses fairly slowly. The main problems with the game’s translation and gameplay don’t come up until later in the game, so it’s worth it to examine parts of the game. Another issue is that due to the translation there’s a lot of chances to read between the lines, which means that you can read more into the story. Note, I am not blaming the translator at all for the translation. From what I read, the text was stored in an incredibly difficult manner to translate without knowing where each line was used.